Blistering speeds, new technologies, and overall comfortable use make the Barnett Ghost 420 Revanant an option for any hunter who looks to spend a decent price for a competitive model. At 420 fps, the crossbow is capable of bringing down any prey, and you will also get plenty of other great features that will convince you that this might be the crossbow for you. The overall lightweight design also contributes to its appeal, and you will feel like you are shooting a crossbow that is more expensive than what the price tag for this model will tell you. Part of the company’s elite series suggestively called Carbonlite, the Barnett Ghost 420 Revanant uses a unique type of carbon construction for the limbs and the riser. This is what also makes it so manageable and light, especially when compared to other models on the market, some even more expensive. The arrow track is made from machined aluminum, another aspect that helps with the overall weight and durability of the model. Capable of outstanding power and speed, the Ghost is a sound investment. A single look at the construction of the bow will tell you everything you need to know about it. Seeing that premium materials are used in its build, it is quite commendable that the manufacturer offers it at such a competitive price for a top-of-the-line crossbow. 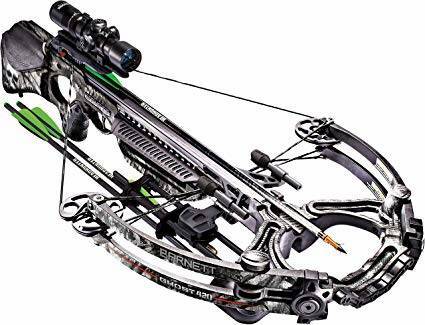 Many crossbows using top-notch materials and delivering speed and performance tend to be heavy, but this one, while not the lightest you can find right now, offers the possibility to manipulate your weapon when you sit in a tree stand or blind, or when you’re navigating through forests and brush. At 7.6 lbs, it is a mid-range pick that will deliver everything you need from it. First of all, the outstanding speed of 420 fps recommends it. Also, the 185 draw weight can tell you a thing or two about how powerful the crossbow can be. Developing 150 ft-lbs of kinetic energy, it is everything you might expect from it, and even something on top of that. Another thing to mention is that this model comes in the Mossy Oak pattern and it will help you blend in with the environment so that no prey can detect your presence. A bunch of features make this crossbow such an excellent choice for someone looking for a reasonably priced top-notch model. First of all, the rifle-style trigger truly makes it feel like you are shooting a rifle. The three-pound trigger with zero creep ensures smooth operation that, in turn, will contribute to your overall accuracy. You should also take full advantage of the Frictionless Release feature that consists of a free-floating roller that slides between the trigger and the sear. What does such a feature mean for you? With no friction, your arrow will stay on course and not suffer any deviations. That means more precision, and you will know that your weapon helps you reach your target. But these features that improve performance and accuracy are not the only ones we should talk about. The nock sensor and the anti-dry fire system make sure that you won’t release your arrow prematurely. This alone can save you a lot of time with replacing the bolt and taking the same operation from the top over and over again. You will surely like the fact that you get a few nice extras with your purchase. The crossbow is equipped with an illuminated scope that will help you shoot in less than ideal light conditions, Picatinny rails, a Talon sling, and a detachable quiver that can be mounted or taken off just by touching a button. As it comes fully assembled, you will have nothing left to do except for installing a single bolt to make the crossbow ready for action. You should not worry about making unnecessary noise when you’re using this crossbow. It is well known that high speeds equal string vibrations, but that should not always be the case. For the Ghost, such issues are readily addressed, as the string dampeners make sure that you won’t have to worry about revealing your location to the wild animals you are trying to hunt. Nobody expects crossbows of high velocity to be truly whisper-quiet, but we can say that this particular model does a reasonably good job of keeping you concealed while using it. There’s a reason why the manufacturer baptized it with the name Ghost, a reference to how silent and deadly the crossbow is. You will get many advantages to enjoy if you pick the Barnett Ghost 420 Revanant from the many models available. 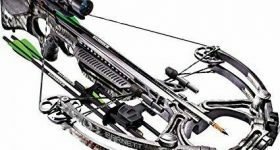 While, at first glance, the price tag on this model might not point out at a budget option, for a crossbow in its league, it is quite a steal. Equipped with innovative technologies and design, it is an excellent crossbow that will steal your heart from the first glance. It does a great job of dampening the naturally occurring noise that happens when you release your arrows.